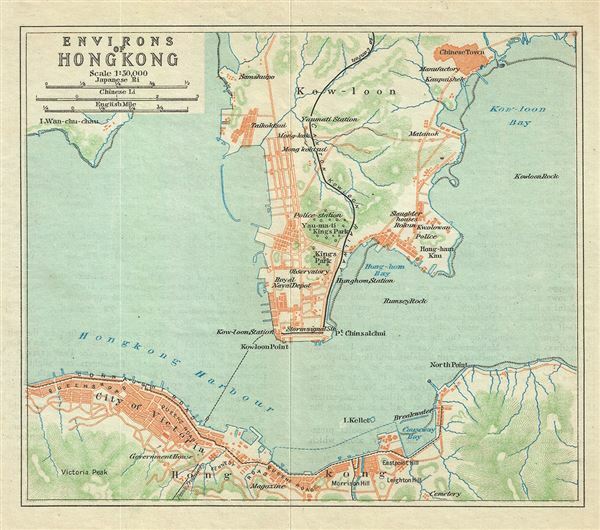 This is a scarce 1924 map of Hong Kong and environs issued by the Imperial Japanese Government Railway. It covers the northern portion of Hong Kong Island including Wan Chai, Central and Victoria as well as Kowloon, noting individual streets, buildings, parks and topography. The Canton-Kowloon Railway line is also noted. This map was issued as part of the 1924 Official Series Vol. D of the Guide to China and printed at the Toppan Printing Company. Japanese Government Railways, Guide to China with land and sea routes between the American and European Continents, second (revised) edition, Tokyo, Japan, 1924. Very good. Minor wear along fold lines.